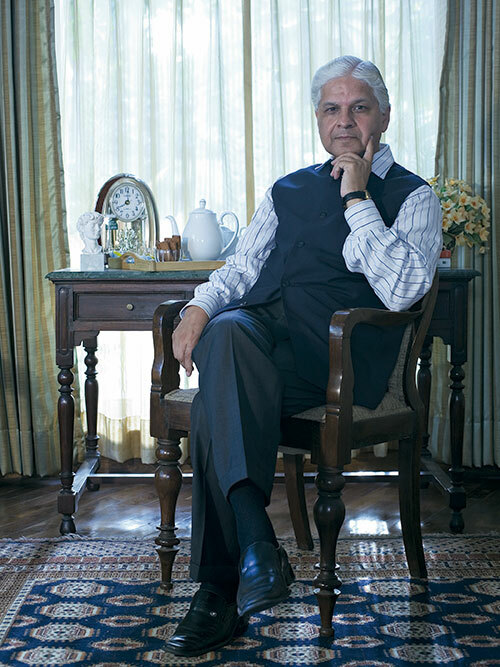 Well past midday, Dr Ashwani Kumar is immaculately dressed in a creaseless navy blue Nehru waistcoat, a silk scarf folded neatly into the breast pocket. If appearance, image and aura are anything to go by, then his emanates a polished cleanliness. Even the air about him seems to purify as he settles down on the neighbouring couch. “It is extremely important,” Kumar begins, “to be correctly and appropriately attired depending upon how others perceive you. Certainly, dress is a mode of communication and expression.” On his first trip to Paris, aged 28, he was made aware that he might possess a quality called ‘good taste’. “I had just finished some time in Oxford as a young lawyer. I was observing a parade on the Champs Élysées and commenting on the jewellery and clothes I saw, oblivious to the fact that a lady was sitting close to us and she was working for Christian Dior. After we got up, she said to my companion, ‘Your friend has good taste’. I don’t even know if she was joking.” On most days, you will find him wearing a Nehru jacket. During summer it’s strictly khadi, “stitched in the traditional style of a kurta pyjama from Punjab”, the state from which he is elected. Sometimes he wears a Pathani suit, which he says reminds him of the North West Frontier province in pre-partition days. And when abroad the bandhgala or a business suit. His wardrobe contains four consistent colour blocks: charcoal grey, navy blue, black and white. Making the inaugural address at the launch of the FICCI Lifestyle Forum, Kumar highlighted the fact that India has a competitive advantage where culture and craft, design and creativity, textiles and gems have been our traditional heritage. Adding that there is significant employment generation potential and a huge market globally and domestically. “What we need to do is build globally acceptable Indian brands. And that requires the urgent addressing of skill upgradation. We have vastly talented people who just require intense training in fine-tuning to be competitive in price, quality and logistics,” he feels. “The government will assist to achieve standards of excellence and competitiveness, which alone will guarantee the sustainability of a business model.” The FICCI forum will also encourage proposals for craft centres, SEZs in jewellery and institutes in high-end fashion. All the while, “needing growth to be inclusivist, making sure that GDP increase makes sense for the have-nots”. This mix of lyricism and legal eagle lucidity is characteristic of the 56-year-old son of a freedom fighter who reads eight newspapers every morning and can drop Urdu shairies in mid speech (a hobby he gleaned from his grandfather, an untutored scholar of the language). The framed academic achievements that adorn his walls are many. This politician holds a doctorate in law and masters in philosophy in international law, after studying at St Stephen’s College, the University of Delhi and Jawaharlal Nehru University. Because of his considerable intellectual powers as a lawyer he was appointed Additional Solicitor General of India in 1990 at the proud age of 37 and subsequently elected to the Rajya Sabha in 2002. The following year he published a book, Law, Ideas and Ideology in Politics: Perspectives of an Activist; he served as Chairman of the Vichar Vibhag (the Congress party’s intellectual cell) and on several committees related to energy, finance, information technologies and commerce; did a turn as party spokesperson and finally became a minister of state in February 2006.